Monday September 18th, 1972: Yogi Berra's Mets were 73-67 in third place 15 games behind the first place Pittsburgh Pirates. On this night 15,622 came to Shea to see the Mets host the Pirates. 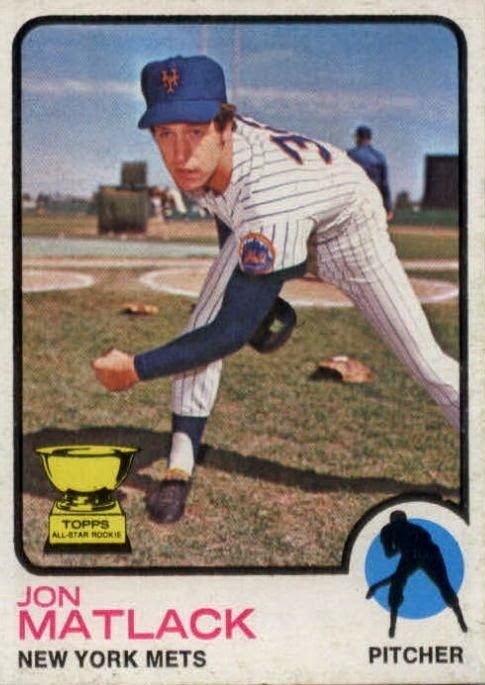 It was a good pitching match up, as the Mets sent that years Rookie of the Year; Jon Matlack (12-9) to the hill against Nelson Briles (14-7). The game certainly stood up to the billing as both pitchers were on their game. Matlack would scatter just five hits along the way, striking out six Pirates allowing three walks. Briles had allowed five hits & two walks along the way, striking out seven Mets. Both pitchers kept their shut outs into the 9th inning. Matlack got the first two outs of the inning, but then gave up back to back singles to Richie Hebner & Bob Roberstson. Matlack then got the weak hitting Gene Alley to pop out. In the bottom of the 9th, Rusty Staub led off with a base hit. Cleon Jones sacraficed Staub over to second. Ed Kranepool then was walked intentionally. The Mets catcher Duffy Dyer came to the plate. Dyer had already had a fine week and a half, he had driven in five runs in his last seven games, including three in a 4-2 win over the Phillies in Philadelphia. Dyer would continue that week & overall drive in runs in seven of ten games. For a brief period in this season, Manager Yogi Berra had named Dyer the teams main catcher over Jerry Grote. In heroic fashion, Dyer delivered with a single to left field scoring Staub. The game may have not meant anything in the standings but it was one of the most exciting wins in the month or even the year for the Mets. This game sealed Matlack as the Rookie of the Year winner as well, & showed the Pirates who had just win third straight NL East title that the Mets were coming in 1973. The Mets would win the 1969 & 1973 NL East titles breaking up the Pirates stretch, that would last until 1976.